The HP Color LaserJet 2840 all-in-one color printer/scanner/copier/fax is a versatile solution for certain limited small business and home office needs. There are many things to consider with purchasing this model. Performance and quality vary depending on what it is that a user is trying to accomplish but it is a decent means to combine the functions of multiple machines into one, in a way that is cost effective and environmentally sound. 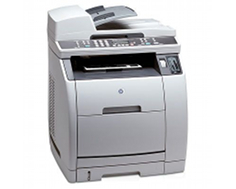 The HP Color LaserJet 2840 prints at a top speed of 20 pages per minute in black and white, which is considered fast for small office, home office and personal use. The speed is the same regardless of settings, allowing the user to print documents at the best quality possible without sacrificing speed. A flatbed scanner can be fed manually or through a 50 sheet automatic document feeder, making it easy and convenient to digitally archive hard copy documents and go paperless. The unit comes equipped with two trays that can hold a maximum of 375 sheets of paper. The multipurpose tray can hold a wide range of media types, both standard and custom sizes, and has a standard capacity of 10 envelopes at once. This machine is ideal for business needs such as text document output, which includes printing and copying of text documents such as memos, letters, invoices and reports. A resolution of 600 x 600 dots per inch provides professional quality printing and copying of text documents. The 96 MB shared memory is upgradeable to 224 MB for increased networking efficiency. The Color LaserJet 2840 is also equipped with built-in 10/100 wired Ethernet network connectivity via one RJ-45 port that can connect to a router or hub for easy integration as a network resource. There is also one built-in high-speed USB port that is compatible with USB 2.0 specifications. Copy settings include contrast, quality, 25 to 400% reduction and enlargement, copy collation, number of copies and paper size. Default scanner resolution is 1200 x 1200 dots per inch and software can further enhance this up to 19,000 dpi. A 256-level grayscale and color scanning option provide for quality scanning directly to digital format. A built-in fax machine with Super G3 capability and a maximum transmission speed of 33.6 Kbps can be used in the standard way via an interface keypad on the printer's control panel or as an internet fax through a network. The recommended duty cycle of 30,000 pages per month is 25% lower than models with only printing capabilities due to the increased wear and tear expected as a result of scanning and copying operations. Print speed for color documents is painfully slow, at only 4 pages per minute, which limits the effectiveness of this model to black and white scanning, copying and printing. 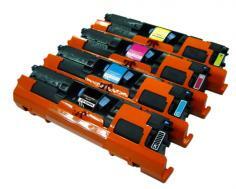 Duplex printing is available but must be performed manually and driver support is difficult to configure. There is limited operating system compatibility and some scanning features are not supported in Mac OS or Linux drivers, making this a primarily Windows-hosted system. Even though this unit combines multiple pieces of equipment into one, the dimensional footprint and weight require a lot of space and a solid desk or table surface. The output tray capacity is one third of the input tray capacity, causing a user to be constantly tending to the machine during high volume copy and print jobs. The power consumption is very high during operation, coming close to 400 Watts, which is the standard operating power of full-sized, industrial copiers that can produce almost twice the volume. Operation is extremely noisy and the occasional self maintenance cycle can be startling and distracting in a quiet, small office or home office environment. Smaller all-in-one machines such as these, with flat bed scanners and automatic document feeders, are highly susceptible to dust and dirt ingress, causing premature failure and quality issues. Review it: "HP Color LaserJet 2840 "
The Color LaserJet 2840 comes with black and color starter cartridges. The black toner cartridge has a maximum yield of 5,000 pages and the cyan, magenta and yellow color cartridges each have a maximum yield of 4,000 pages. 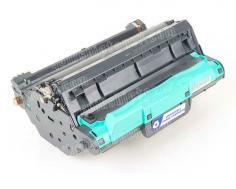 The toner yields in the starter cartridges are the same that are available through replacements.